Beautify CNMI! : Enjoy Sunday Brunch and Support Beautify CNMI! 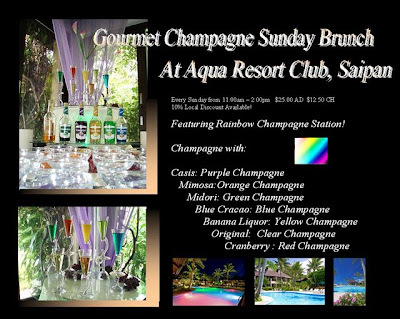 Enjoy Sunday Brunch at Aqua Resort and Support Beautify CNMI! Aqua Resort is offering a 10% discount to all locals who enjoy their Gourmet Champagne Sunday Brunch in January, February, and March. In addition to the 10% local discount, Aqua Resort is donating another 10% from the price of each brunch to Beautify CNMI!